Thorlabs' Near Infrared Transmission Gratings are designed for the 500 nm to 1.8 μm range. Due to their basic simplicity, transmission gratings are beneficial for use in fixed grating applications, such as spectrographs. The incident light is dispersed on the opposite side of the grating at a fixed angle. Transmission gratings provide low alignment sensitivity, which minimizes alignment errors. These grooved transmission gratings were designed for optimum performance in the near infrared, offering different levels of dispersion. In most cases, the efficiency of these gratings is comparable to that of reflection gratings such as Ruled Gratings or Holographic Gratings when used in the same wavelength range. By necessity, transmission gratings require relatively coarse groove spacings to maintain high efficiency. As the diffraction angles increase with the finer spacings, the refractive properties of the substrate materials used limit the transmission at the higher wavelengths and performance drops off. The grating dispersion characteristics, however, lend themselves to compact systems utilizing small detector arrays. The gratings are also relatively polarization insensitive. Our NIR transmission gratings are offered in two different sizes, with a choice of two groove angles. Please see the graph to the right for performance characteristics. Please see the Gratings Guide tab to choose the right grating for your application. Thorlabs' gratings can be mounted directly into the KM100C Right-Handed or KM100CL Left-Handed Kinematic Rectangular Optic Mount for precise and stable mounting and alignment. Thorlabs uses a clean room facility for assembly of gratings into mechanical setups. If your application requires integrating the grating into a sub-assembly or a setup, please contact us to learn more about our assembly capabilities. The absolute efficiency plotted here includes Fresnel reflections. 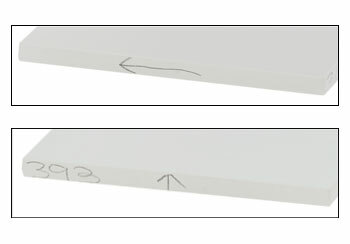 Top Image: On one edge of the grating, an arrow parallel to the grating's surface indicates the blaze direction. 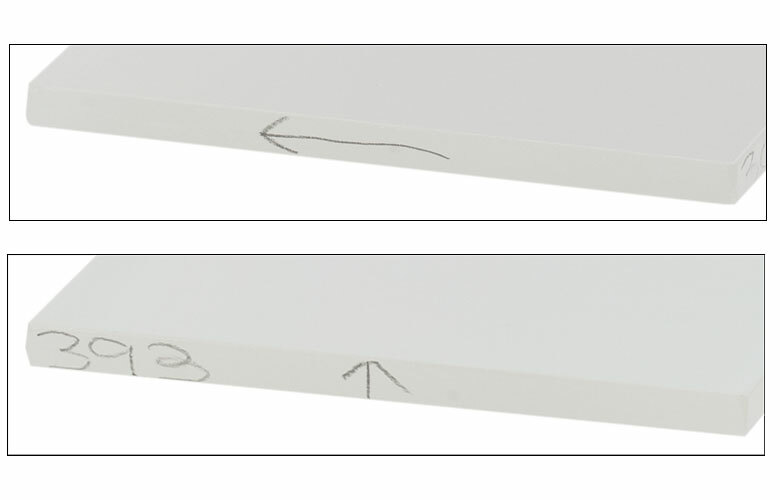 Bottom Image: On the opposite edge of the grating, an arrow perpendicular to the grating's surface indicates the transmission direction. Hello, thank you for contacting Thorlabs. In the general case, you can use equation (2) from the Gratings Tutorial to characterize light transmitted through a grating. The angle given is the blaze angle which is used when operating in the Littrow configuration which maximizes m=1 efficiency. Blaze angle is equal to the angle of incidence in this special configuration. I will reach out to you directly to discuss your application. Hi there, I am wondering if you make costume design transmission grating? I need some at 871nm with >1500lines/mm. please notify me via e-mail. Thanks. We will contact you directly to find out more about your application and requirements to see if we can provide a custom solution. Dear Sir: The absolute efficiency of the GTI NIR transmission grating at the overview page is different to the Catalog.pdf file in the website (http://www.thorlabs.com/thorProduct.cfm?partNumber=GTI25-03). In the overview (http://www.thorlabs.com/images/TabImages/GTI_Trans_780.gif), the blue line is the GTIxx-03 (24.8° Blaze Angle), but the Catalog.pdf file show the blue line is the GTIxx-03A. Can you tell me which is correct? Thank you very much. Response from Sean at Thorlabs: Thank you for pointing out the inconsistency. The plot on our catalog page was correct. We have updated the plots on our webpage for correctness and clarity. Response from Javier at Thorlabs to Mutsuo Ogura: Thank you very much for contacting us. We will contact you directly in order to assist you with your application.